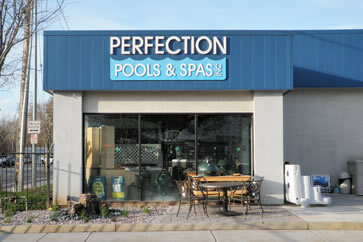 Perfection Pools was founded in the spring of 1980. We were originally located in an old barn in south Chico, owner Terry Larocco ran the business literally out of the back of his pick-up truck for the first three years. The business went on to open a retail outlet that displayed a pool and a couple of spas and a modest supply of chemicals and pool products. The company has grown and re-located twice since then and we are now proudly operating in 6,000 square foot building occupying nearly a one half city block on the corner of Park Ave. and 20th Street. This family business has evolved over the years, but has still been able to keep its small business feel while supplying the best in quality and service to our customers. Come on down and see what we can do for you here at Perfection Pools and Spas.